A few hundred mourners gathered Wednesday for a private Catholic funeral service for Dallas police Sgt. Michael Smith, a former U.S. Army Ranger known for his upbeat attitude and compassionate approach to others. 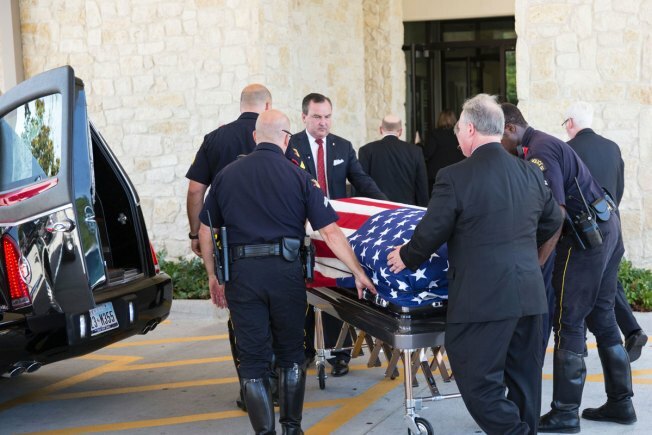 Smith, his wife and their two daughters were members of Mary Immaculate Catholic Church in Farmers Branch, north of Dallas, where his service was held Wednesday. "My heart is broken, and I am full of rage," said Smith's sister Yea-Mei Sauer. "He was taken so senselessly, violently, unjustly, and I rack my brain, I pray, trying to think of what he would do, say." His sister spoke at the ceremony of all the qualities Smith possessed that made him a "cop's cop." "My brother's murder will not be in vain, his selfless legacy will live on," Sauer said. "He would want us to continue the good fight, to be guardians, leaders, peacemakers, to love one another, to set the example, because that is what we are supposed to do." Pastor Rev. 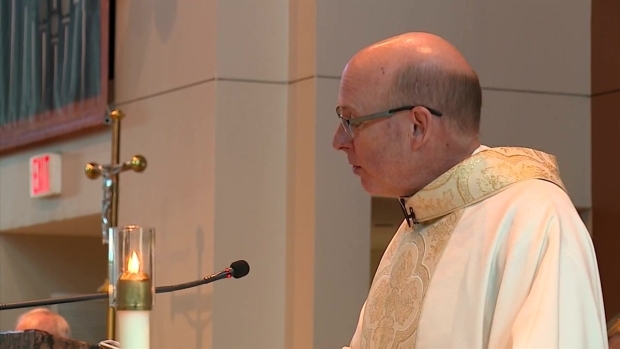 Michael Forge delivers remarks at the funeral mass for Dallas Police Sgt. Michael Smith at Mary Immaculate Catholic Church in Farmers Branch on Wednesday. A public service is scheduled Thursday for Smith at a Dallas church where he worked security. Smith was an Army Ranger before joining the Dallas police force in 1989. He once received a "Cops' Cop" award from the Dallas Police Association. Smith and four other officers were fatally shot last week during a protest against the police killings of black men in Louisiana and Minnesota. Nine officers and two civilians were injured in the attack. "There is no comfort us for right now, we are raw and we are wounded," Sauer said. "But I know Michael is in the arms of God now, I have no doubt."